ments. The spa also offers a collection of inspi- rational books, jewelry, workout clothing, skin care products and more. Next to the spa, a fit- ness center overlooks the Bay and makes the minutes on the treadmill fly by. The hotel is naturally a popular wedding site, with some 80 or more weddings occurring annually on the terraces over the ocean, fol- lowed by receptions outdoors or in one of the elegant event rooms. All wedding vendors and details are coordinated by hotel staff to make for a "seamless" experience. "I've been here for 24 years," Narigi smiles. "We try to set ourselves apart and take a great deal of pride in it." 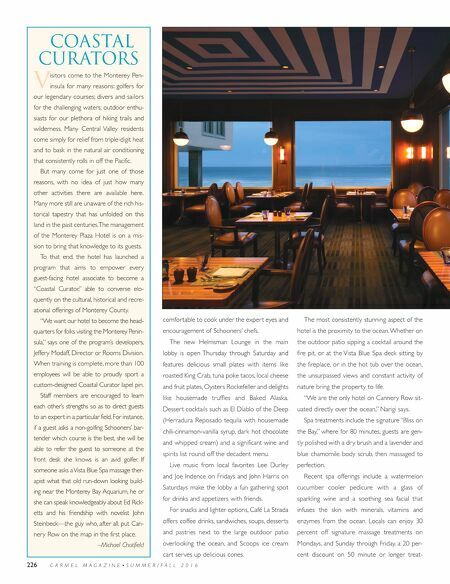 Monterey Plaza Hotel & Spa is located at 400 Cannery Row, Monterey, Calif., 93940. 831/920- 6710 or www.montereyplazahotel.com. C A R M E L M A G A Z I N E • S U M M E R / F A L L 2 0 1 6 227 Monterey's Coolest Pop-Up Events French Flea Market Outdoors on the Side Lot Antiques . Music . Food Vintage Automobilia Concours Posters Cannery Row Antique Mall • 471 Wave Street • Monterey www.canneryrowantiquemall.com Monter happen at Cannery Row Antique Mall. 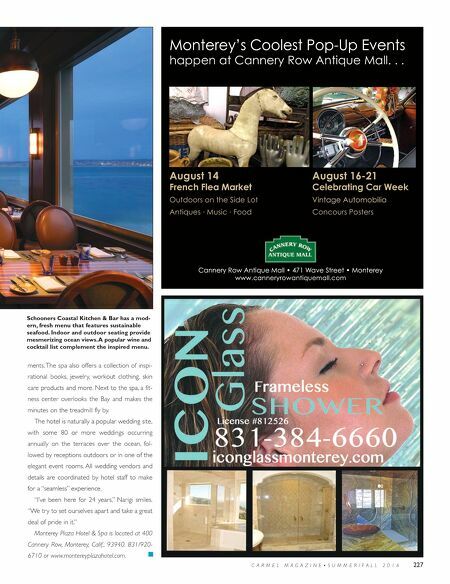 . . ey's Coolest Pop-Up Events August 14 V French Flea Market intage Automobilia Celebrating Car Week August 16-21 www.canneryr Cannery Row Antique Mall • 471 W www.canneryr ave Str owantiquemall.com ey eet • Monter Schooners Coastal Kitchen & Bar has a mod- ern, fresh menu that features sustainable seafood. Indoor and outdoor seating provide mesmerizing ocean views. A popular wine and cocktail list complement the inspired menu.